It's two for one this week on Finish it Friday! 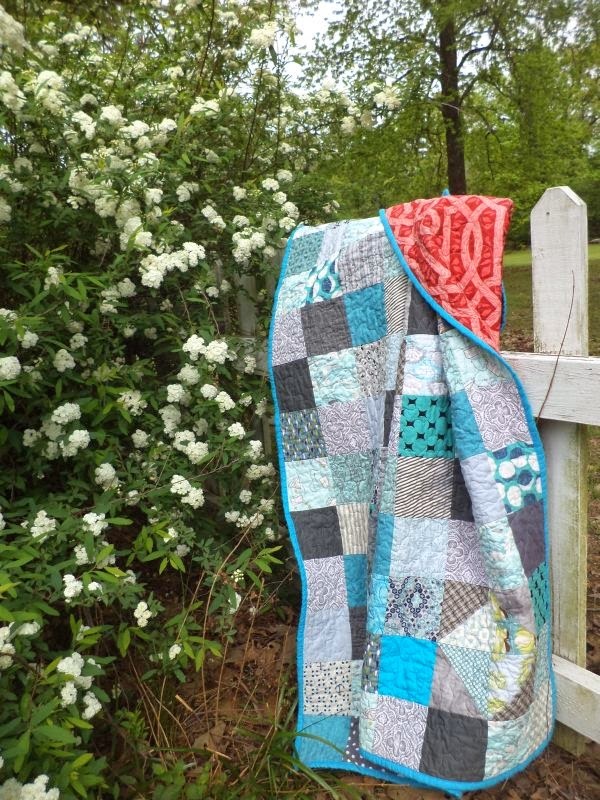 I made these two medium sized scrappy quilts from my ever-regenerating scrap piles. 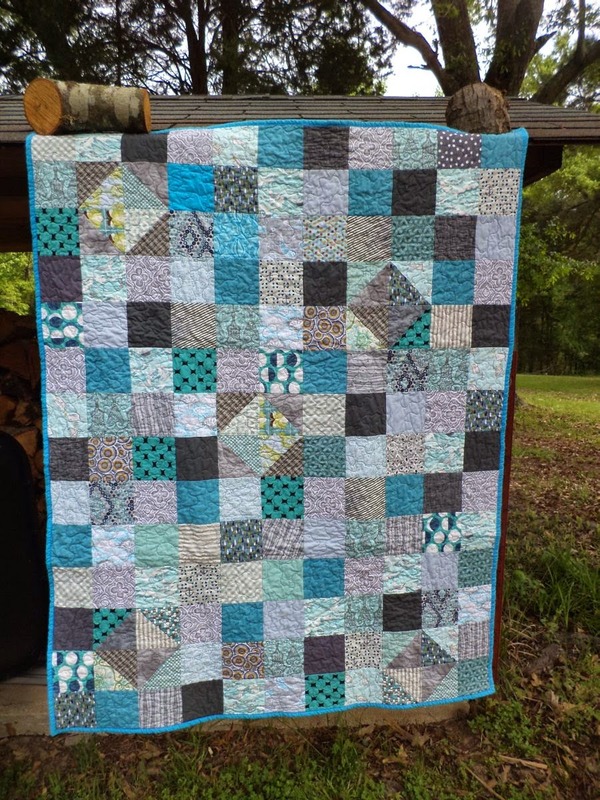 First up, the blue and grey scrap quilt I made based on Cynthia's design is done. As this one is a bit too small, and too childish for Covered in Love I decided to put it in my Etsy shop. The quilt finished at just over 42" x 54" after washing. The backing is an awesome Joel Dewberry print. Can you believe I found this on sale for like $2.50 a yard at Hancocks? Needless to say, I boght the whole bolt. I thought the red was fun against the rather monotone top. 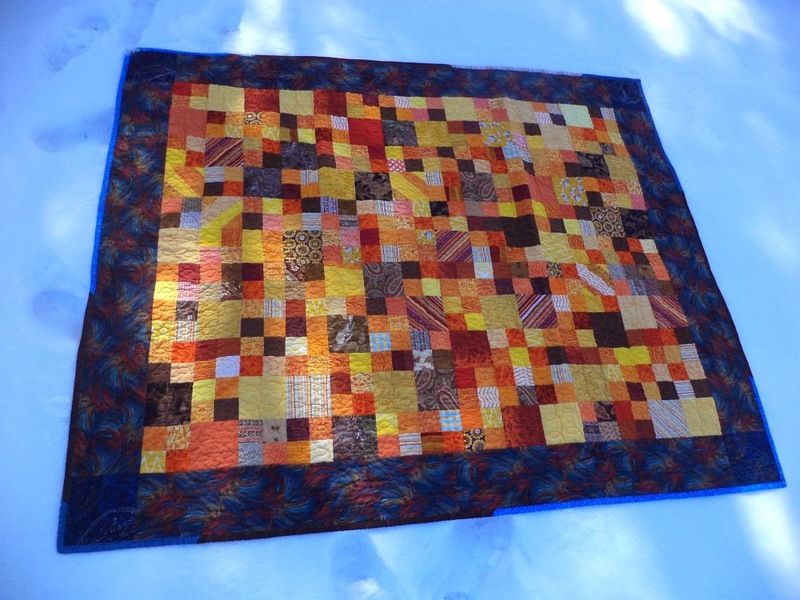 The second quilt finished is another simple scrappy patchwork. This time from oranges, brown, and reds. It wasn't quite big enough before so I added borders to bring it up to size. I went with FMQ loops in the 2" squares. 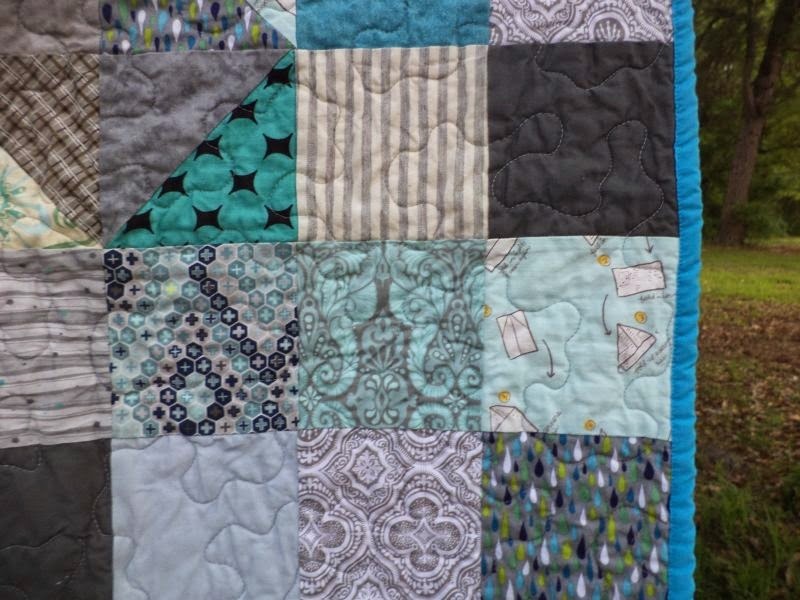 The binding is a scrappy blue and brown leftover from the blue and brown string quilt. This one is going in the stack for Covered in Love to go to the hospital. 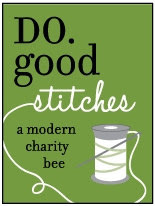 If you are interested about learning more about my charity project Covered in Love you can read more on the main page. Linking up to Crazy Mom Quilts Finish it Friday and Sunday Scrap at Quilting is more fun than housework. Congrats on two finishes this week! It must feel nice to use up so many scraps. I seem to just be accumulating...not so much using up my scraps! You've been busy! 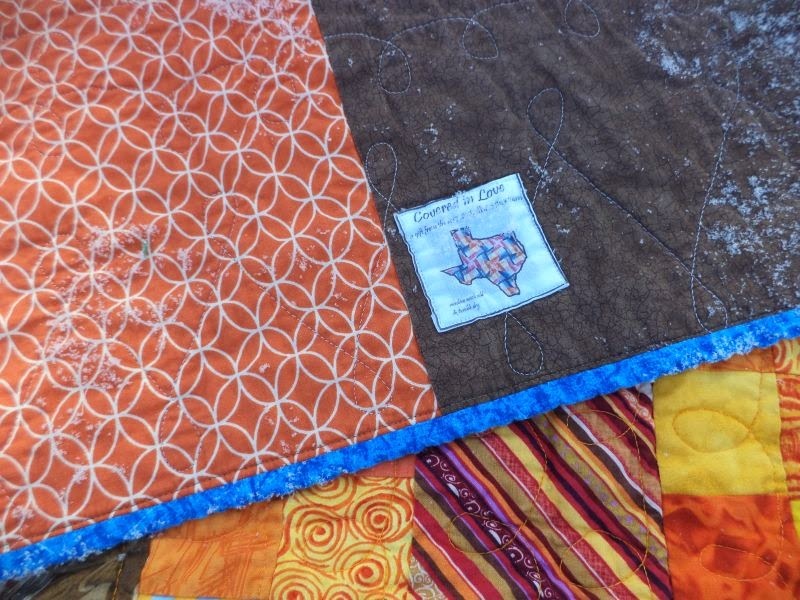 How cool to make an attack on the scrap pile; both quilts look great. And what a super charity, all the best with it. Two finished quilts in a week, congratulations. I love that orange one so much, simple and beautiful. 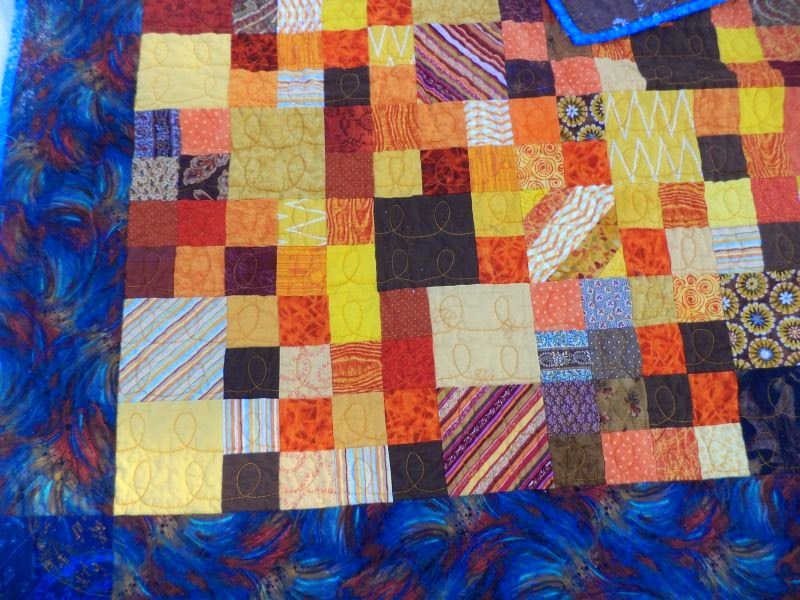 I love scrappy patchwork! The blue and grey one really appeals to me because it's scrappy, but with a color scheme. I want to make one like that! It's also fun because if the HsTs here and there. Both finishes are beautiful!